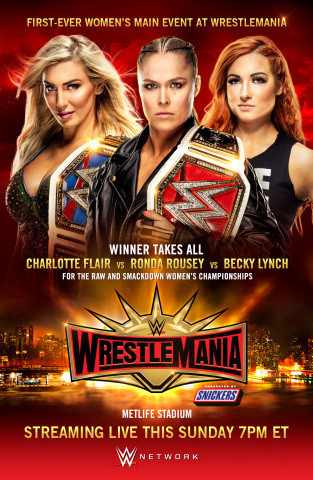 STAMFORD, Conn.–(BUSINESS WIRE)– WWE (NYSE: WWE) today announced that the first-ever women’s main event of WrestleMania featuring Ronda Rousey (Raw Women’s Champion) vs. Charlotte Flair (SmackDown Women’s Champion) vs. Becky Lynch will now be a “Winner Takes All” Match for both the Raw and SmackDown Women’s Championship titles. WrestleMania takes place this Sunday, April 7 in front of a capacity crowd at MetLife Stadium and streams live on WWE Network around the world at 7 pm ET. Charlotte Flair is now an eight-time Champion after winning the SmackDown Women’s Championship this past Tuesday vs. Asuka. Flair is a former Division 1 volleyball player, philanthropist, author, and is the daughter of two-time WWE Hall of Famer Ric Flair. Ronda Rousey is the current Raw Women’s Champion, Olympic medalist, the first female UFC Champion, and the first woman to be inducted into the UFC Hall of Fame. She is also an actress and New York Times bestselling author. Becky Lynch is the 2019 Women’s Royal Rumble winner, a two-time SmackDown Women’s Champion and was named Wrestler of the Year by both Sports Illustrated and CBS Sports in 2018. She was also the first woman ever to top ESPN’s WWE Power Rankings. WWE Universal Championship Match: Brock Lesnar (c) vs. Seth Rollins (2019 Royal Rumble winner). WWE Championship Match: Daniel Bryan (c) vs. Kofi Kingston. Roman Reigns vs. Drew McIntyre. No Holds Barred Match: Triple H vs. Batista (If Triple H loses, he will be forced to retire from in-ring competition). Falls Count Anywhere Match: Shane McMahon vs. The Miz. Women’s Tag Team Championship Fatal Four Way Match: Sasha Banks and Bayley (c) vs. Natalya and Beth Phoenix vs. Nia Jax and Tamina vs. The IIconics. Intercontinental Championship Match: Bobby Lashley (c) vs. Finn Bálor. United States Championship Match: Samoa Joe (c) vs. Rey Mysterio. AJ Styles vs. Randy Orton. Farewell Match: Kurt Angle vs. Baron Corbin. WWE Cruiserweight Championship Match: Buddy Murphy (c) vs. Tony Nese. Andre the Giant Memorial Battle Royal featuring Michael Che and Colin Jost of SNL fame. Women’s Battle Royal featuring Superstars from Monday Night Raw, SmackDown Live and NXT. ZOMBIE TRAMP VOLUME 17 The new Zombie Tramp’s first collected adventure! FIRST COVERS AND DETAILS TO ‘BLADE RUNNER 2019’ REVEALED!